The Nokia 6 was among three smartPhones (Nokia 3 and Nokia 5) announced by HMD Global, at MWC 2017, where a new variant of the classic Nokia 3310 was also unveiled. The Nokia 6 runs on stock clutter Free Android 7.1.1 with the company promising regular updates for it. The Nokia 6 has a 5.5-inch IPS LCD 1080p Full HD display, with an aspect ratio of 16:9, 2.5D Corning Gorilla Glass, and a brightness of 450 nits, and Sunlight readability. The device has a full metal body made of aluminium.The Nokia 6 is powered by an octa-core Qualcomm Snapdragon 430 processor, with 3GB of RAM. There is a limited edition Arte Black Nokia 6 which has 4GB of RAM and 64GB of storage. The regular variants of the phone have 32GB of storage, and supports up to 128GB of expandable storage via a microSD card slot. The Nokia 6 sports a 16 megapixel rear camera with phase detection autofocus and dual LED Flash, and an 8 megapixel front camera. The Nokia 6 has Dual speakers, and a Smart amplifier (TFA9891) with Dolby Atmos. The phone supports NFC, 4G LTE connectivity, and will be available in single SIM and Dual SIM variants, and is backed by a 3,000 mAh battery. The Nokia 6 has a fingerprint scanner housed in the home button. 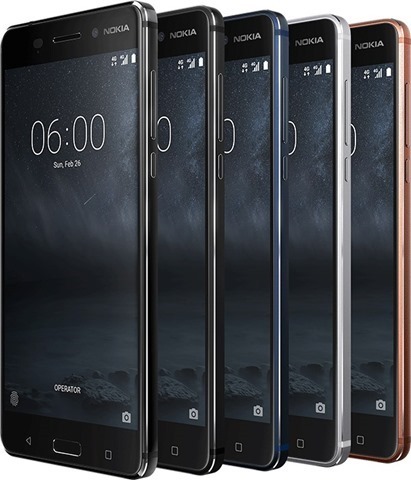 The Nokia 6 will be available in 5 colours: Arte Black (limited edition), Matte Black, Tempered Blue, Silver, and Copper. The Nokia 6 has been priced at €229 (Europe), which is about Rs. 16,100 or $242. Here's all you need to know about the new Nokia 5 announced at MWC 2017.